In September, after creeping a great knitting forum called knittingparadise.com I decided to start a Swap for Canadian knitters. (Basically I collect forms and match up knitters who then send their package to their secret pal. It is a great way to get a little sunshine in your mailbox.) My motivation was really just that I am sick of making excuses for my finances, and with a Canadian Swap and a 10$ package limit I could actually afford to participate in the swap. So… I started it. I was so surprised to have over thirty ladies join and it was completely successful with every participant receiving their package… so I decided to do an October one. However this month the ladies who do the other international swap announced that they were taking a break until January. So… I was getting a ton of people asking to be in the Canadian swap but I had promised all the Canadians, Canadian partners so I started an International Swap too. About this time my computer died. C. was working on his applications for his PhD funding so I couldn’t have much time on his laptop. So I was kinda screwed. I did the lists by hand and sent out the Pm’s whenever I had a second. 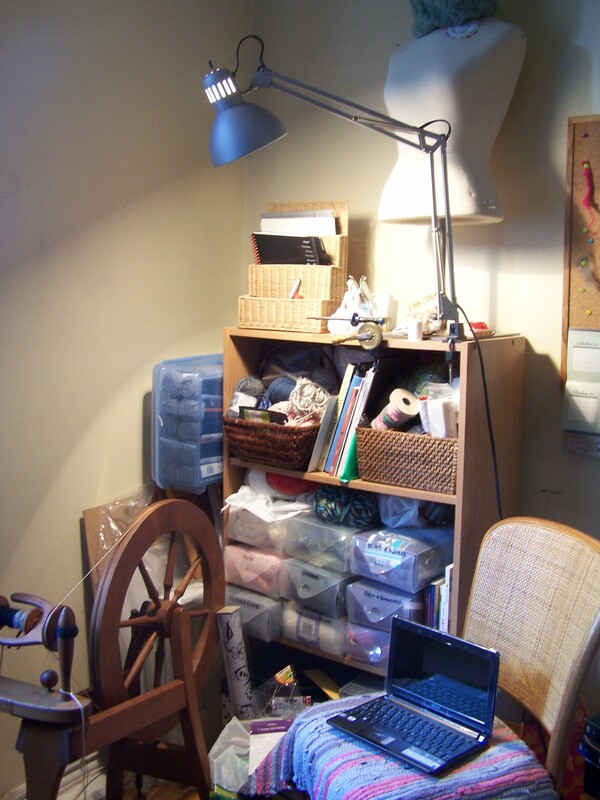 Half of my new-ish Knitting and Spinning relaxation corner. Also around this time a very special lady decided that because I had volunteered to do the international swap I was worthy of receiving small gifts from my participants. At first I was so uncomfortable with the idea, but the more encouragment I got from participants, virtually strangers, the more okay I as with it. A bunch of ladies sent me $10 (and some very generous people gave more, which brought a tear to my eye every time) Within two weeks I had the funds to get a new netbook so I could continue with the swaps. I am more grateful than words can say to each and every member who helped me get this machine. It has served to renew my faith in the goodness in the world. I have been taking steps to learn to deal with the residual pain from surgery, which is chronic. I have tried to claw my way out of the darkness, depression and overall ickyness that has gripped me since I realized I am probably not going to get all better. I realize now that if this is the case I have to learn to deal with my life as it is rather than lamenting it isn’t what I like. This is obviously a daily and constant struggle. But I am trying. It is the best I have right now. I see my surgeon in December and will update as to what my surgeon says. However at this point my WSIB worker has written to my surgeon saying that he hasn’t provided sufficient medical documentation to require me not to go back to work. If you remember the last time I talked to my surgeon he told me I was not healing as quickly as he would like and he didn’t want me to stress my back or return to work for six months. That was in August. Somehow his 25 years of experience and position as the head of orthopaedic surgery, nor the titanium in my spine, nor my persistent nerve pain down to my knee, nor the x-ray from August is enough medical proof that I am not faking or exaggerating my pain and that I still need more time to recover. The worst part is that I want to go back to work. Badly. I want to have options in my future, financial decisions I can actually make, a means to better my situation. But I still am in so much pain. And I am trying to learn to deal with it. But I am not there yet. And I am scared I will hurt myself more. Oh, and I have gained 50 pounds, just to add that in there. Eventually I will be ok. Eventually I will be able to move on from this injury. But right now I am still learning to deal with the pain. Is that even possible?? As always, thanks for reading!! -S.
Yes, I do understand the fetal position!! Have you ever tried z-lying? You put your feet up on a chair while you lie down essentially making your body into a z shape. It is the only position I have found relief in. I too am on the wrong side of the fifty/fifty stats. I go back in for surgery in August to either remove the hardware or to re-do the fusion 360′ around rather than just the back part. I am so fed up with the whole thing. I am going on two and a half year since my injury. I hope you keep in touch. I don’t know how to contact you outside of replying to your message so hopefully you come back and leave an email maybe? I sincerely appreciate you taking the time to write a comment. It touches me everytime. I hope to hear from you soon and that this note finds you well and happy! Wow, after reading your story, I couldn’t believe someone went through what I have! Your story is almost mine completely. I have had the same fusions as you plus my neck is almost completely fused. I am fighting now for SSDI after being on Long term disability for 12 months. My job have let me go because of being able to do my job properly while being on all my meds. I am not allowed to drive and can barely walk. I have 3 more areas that need to be fused, so that will make my spine almost completely fused. I am waiting on the surgeon to decided that it is critical enough for surgery. Don’t go back to work till you can truly handle it, I went back too early and that actually damaged the disc above the fusion. Hang in there and discuss your pain more with your doctor for a change in your meds. I feel for you and will pray for your healing psychically and emotionally. Thanks so much for reading, and for the understanding and empathetic comment. I have emailed you, but just wanted to say thank you once again. Hi S. It’s so good to hear from you. What a lovely bunch of knitters you have discovered. The obstacles you have overcome and continue to deal with would crush most of us, yet you keep on going and you are an inspiration to me and, I’m sure, to many others. I love knowing how you’re doing, so post when you feel like it. Take good care. I think of you often. I am thrilled you are still around with how neglectful I have been! It hasn’t been easy lately, between general depression and pain meds I have felt so lethargic I can barely convince myself I should get up. So please forgive me. I don’t know why I punish myself by neglecting people that make me happy, I just don’t seem to have enough energy these days. Thank you for your kind words as well. It means a lot to have some one flat out say I have been dealt a crap blow. And that, at least to the outside world, I seem to be dealing okay. Somedays I doubt that, but I suppose that is the malaise of humanity. And it’s greatest gift… Reflection. Thank you thank you thank you. And I think of you often as well, in fact I still read your new entries almost religiously. You are so full of wisdom, I wish we could curl up with some cups of tea, a kleenex box and just talk. I feel I could learn a great deal about self fulfilment and happiness from you and I think I need to learn that lesson I just don’t know how. I accept those hugs greatfully, and return them with gusto! Tons of love, Darling. xoox – S.
Nope it isn’t quite that involved. Basically I get people to fill out forms with their address and preferences in knitting related things and everyone has to put together a package that costs less than $10 out of pocket (they can add items from their ‘stash’, which is what fibre lovers usually refer to their mountain of yarn and fibre as, but they can only spend $10 on additional gifts) then they send it to the person I assigned them. It is usually quite fun and it is easy enough that there isn’t any stress involved for the participants. For me, however…. Let’s just say that sending 175 private messages is not something I want to finish doing or ever do again! Haha, I am going to be breaking it up next month because that is too many for one sick person to handle! Anyway, you put together a package and send it to your partner. You also receive a package in the mail. It is just a fun way to get rid of some great yarn you just don’t want and receive something new, usually something you can drool over! 😛 So far the results have been so so… Most packages were fine, but I had over 25 outstanding at the deadline last month and have to write that many notes… And the enrollment doubled this month so I am rather… Overwhelmed? I love hearing from you! So don’t ever feel as though you have to be excused for ignorance. I would say it is satisfying a curiosity. After all, ignorance is not knowing and always not wanting to know, curiosity is not knowing and always wanting to know! I see you as more of a curious person than an ignorant one. How cool of those ladies! Glad you got up and running again! Looks like your outlook has improved a bit too! Is that some hope I sense in your writing? 🙂 So you knit huh? Me too! Seriously! Some of the nicest people I have ever met. Hope… Maybe. I feel more like it is just that I am accepting the reality of my situation rather than trying to fight it. But it also causes a lot of other problems, like if I accept that this is as good as I get, how do I want to do thing? I dunno I can’t actually put into words how I feel yet. It is like I have lost all hope of being normal, but that has created a new goal… Accepting and working with it. Somedays I just can’t. I have to rant and be angry because I still am. I can’t seem to shake the anger. Anyway, thanks for coming by!! Oh, and yes I do knit. Have you checked out Ravelry.com?? If not, you need to. EMail me and I will give you my name on there! 😀 Then you can see what I have done! 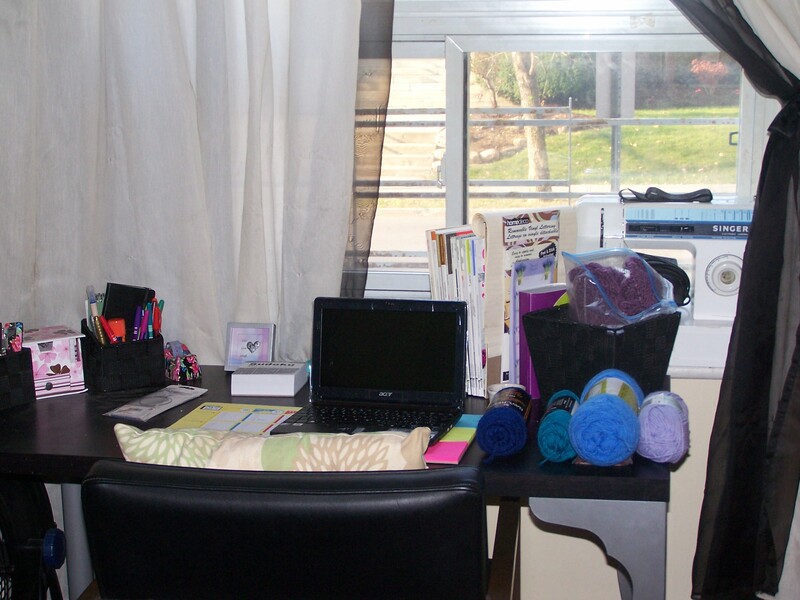 How fantastic are you on the Swap for Canadian knitters. You are amazing. It’s strange but I clicked on my link to you today and wondered how you were getting along. I’ve been concerned. Thanks Caroline. Seriously, I love that you still come by.